The omnipresence of rood screens in Italian churches was not recognized when I reconstructed the structures in the Florentine churches of Santa Maria Novella and Santa Croce in the early 1970s.1 In this study I synthesize the material on the Italian rood screen published since then and address some of the questions left unresolved by earlier research. I restrict myself to the Italian tramezzo, the most generic term in Italian. Of course there were Lettnern, jubés, and rood screens all over Europe in the late Middle Ages, but they are on the whole better studied than their Italian counterparts, which at this stage need to be understood in their own context.2 What distinguishes the Italian screens studied here from those in the Eastern Orthodox churches, and those cathedral screens in Germany and France discussed by Jacqueline Jung, is that the Italian screens are to be found exclusively in monastic churches and therefore functioned as an extension of clausura. In addition to protecting the privacy of the religious community, the screens had other functions: they served to segregate three populations, for laywomen were separated from laymen; at least in Florence, they provided a stage for the presentation of the sacra rappresentazione; and the screens preserved the mystery of the liturgy. 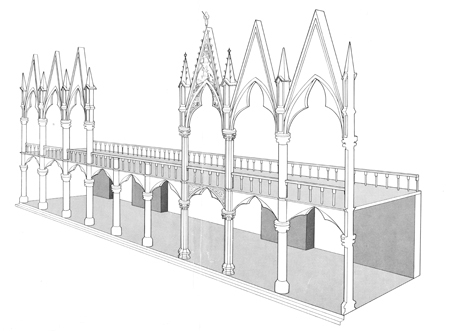 Isometric reconstruction of the tramezzo at Santa Croce, Florence. Drawing: Marcia B. Hall. Three basic arrangements were possible. The first is exemplified by Santa Croce in Florence (fig. 1) and the second by the Frari in Venice (fig. 2), both Franciscan churches. The Trecento construction in Santa Croce, shown in my reconstruction, is the earlier and the more elaborate. Here the tramezzo was a deep structure, supporting a balcony above, from which the Gospel could be read, sacre rappresentazioni and special liturgies could be performed, and the organ accommodated. 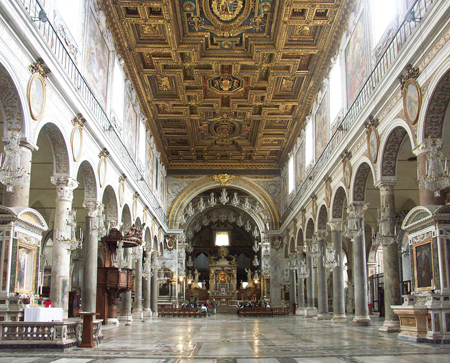 The tramezzo spanned the entire church, aisles included, and was pierced by three doors. The Gothic pinnacles reached to a height of more than fifty feet (almost seventeen meters) and chapels were placed beneath its vaults across the front of the lay section of the church, like those we find on rood screens in other parts of Europe, especially Germany. The tramezzo, including the foundations required by such a massive stone construction, was part of the original fabric.5 A similar structure, though perhaps not quite so visually impressive, was an original part of the early Dominican church of Santa Maria Novella in Florence (fig. 3), which then served as a model for other churches of the order, such as Santi Giovanni e Paolo in Venice and Santa Maria sopra Minerva in Rome. Both these structures were separated by half a bay from the friars’ choir, which was in the nave, enclosed on three sides and open to the altar. Tramezzo at the Basilica di Santa Maria Gloriosa dei Frari, Venice. Photo: cayugahull08. The screen in the Frari in Venice, built in 1475, was a single partition in the nave only, and served as the front part of the choir enclosure in the usual place in front of the high altar. Such single structures seem to have been the typical solution in smaller churches, and especially those of a single-nave plan. In the case of the huge Frari, the compromise design may reflect aesthetic preferences of the later Quattrocento. Plan showing ponte of Santa Maria Novella, Florence. Drawing: Marcia B. Hall. Plan of Michelozzo’s San Marco, Florence, 1450. Drawing: Timothy Kaehle. 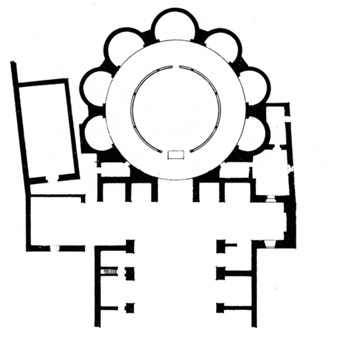 In the other Dominican convent in Florence, San Marco, the church was designed with three separate spaces, for the friars, laymen, and laywomen—and this was as late as 1436 (fig. 4). The construction of the church was undertaken by Cosimo de’ Medici, who chose Michelozzo as his architect. The friars’ choir was placed in the usual location in front of the high altar, but in a kind of pre-chancel. It was separated from the upper nave by a wall with a central door. This area between the choir and the tramezzo was designated for laymen. In the women’s church outside the tramezzo there were four altars and benches for hearing confessions.19 Thus Michelozzo created in a single-nave church a division of space that functioned in a way similar to the much larger three-nave mendicant churches. Alternative reconstructions of tramezzo, Ognissanti, Florence. Drawing: Irene Hueck. San Marco is exceptional. A typical solution for single-nave churches is represented by another Florentine church, Ognissanti, which until very recently belonged to the Umiliati. The single partition was like that in the Frari. The screen there has been reconstructed by Irene Hueck in order to understand how some important paintings might have been displayed on it (figs. 5-6). Her alternative reconstructions show the great Madonna and Child Enthroned with Angels of Giotto placed either on the top of the tramezzo or above an altar on it, facing the lay church.20 In either case we find a simple partition dividing the upper nave (space reserved for the clergy) from the lower nave of the laity (fig. 7). 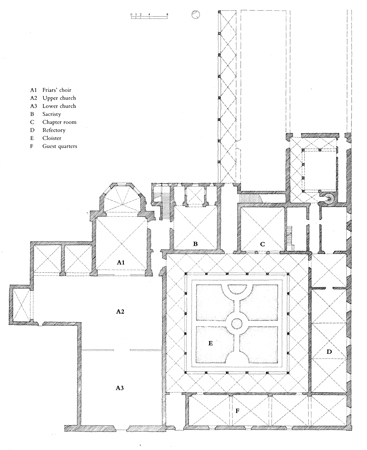 Plan with tramezzo and choir enclosure, Ognissanti, Florence. Drawing: Irene Hueck. Just how the laity were deployed in these single nave churches is not entirely clear. Antoninus21 stated in his Summa that laymen were not allowed to mix with the clergy in their choir when they were saying divine office.22 I have always assumed that there would be what was called in the English churches a “walking space” between the tramezzo and the choir enclosure, even when the tramezzo was only a partition.23 Hueck’s reconstruction, based on careful research and a number of references, does not allow for such a walking space. The problem this arrangement raises, liturgically speaking, is that anyone passing through the door would enter directly into the choir, which surely would not have been allowed. If laymen were allowed in the upper church when the choir was in use, they may have entered through a door on the side of the church. The door in the tramezzo would have been used primarily for processions on certain occasions when the friars would pass through the lay church and into their own. 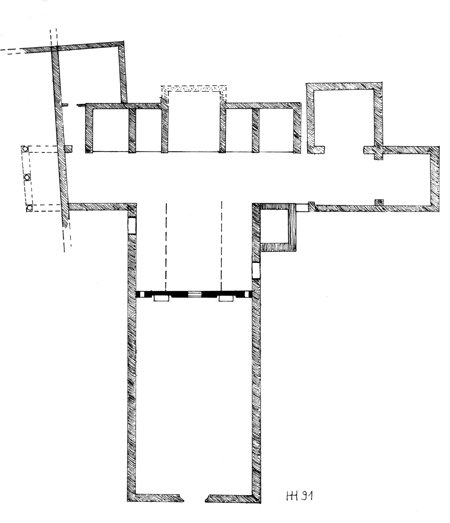 Cooper’s plan of San Francesco, Arezzo,24 shows such a walking space between tramezzo and choir enclosure. In some small single-nave churches, the choir was not even enclosed, as was the case in San Michele at Badia a Passignano, where the choir stalls were placed along the side walls of the church and probably across the back of the dividing wall. In this case it seems certain that the upper church was entirely reserved for the clergy and was off-limits even to laymen. The double-storied tramezzo had a unique function: it was used in Florence as the stage for the performance of sacred plays. This material has been studied by Nerida Newbigin, on whom I depend for what follows.28 Certain confraternities were responsible for the annual production of plays on the appropriate feast. For example, in the Carmelite church, the Ascension was performed; in Santo Spirito, the descent of the Holy Spirit at Pentecost; and perhaps in Santissima Annunziata (and later in Santa Felice), the Annunciation. These were highlights of the year and were obviously a focus of civic pride, for there were instances when the performance was repeated for the benefit of a special diplomatic guest. These performances continued throughout the Quattrocento, but died out toward the end of the century. In Rome, the famous performance of the Passion play was staged in the Colosseum, not in a church. Twenty-five years ago, before recent research on the icon and the iconostasis, it was startling to acknowledge that the congregation in the lower church could not have seen or even heard much of the liturgy performed at the high altar. This is acknowledged by the stipulation of the Dominican chapter general of 1249 (referred to above) that windows might be made in the screen that could be opened to permit the laity to view the elevation of the Host.29 Today it is recognized that the rood screen was intended to function in a way similar to its Byzantine counterpart: it screened the mystery of the performance from the laity and substituted an iconic image, the rood, for their contemplation. Luther complained that this mystification revealed the Church’s arrogance toward the laity: “They take every precaution that no layman should hear the words of Christ, as if they were too sacred to be delivered to the common people.”30 The Counter-Reformation quietly acknowledged this and began tearing out the rood screens all over Catholic Christendom. Questions that remained unresolved in the 1970s were how extensive was the use of tramezzi, and in what kinds of churches did they appear. No subsequent research has been directed to these questions, but by inference one can now come closer to satisfactory answers than was possible twenty-five years ago. Evidence of tramezzi, either of the single wall or double structure, has been found in at least one church of the Cistercian,37 Valombrosan,38 Camaldolese,39 Cassinese, and other types of Benedictine orders,40 and in each of the mendicant orders41—so it seems safe to say that it was a typical feature of pre-Trent monastic churches in Italy. Cooper’s recent research tends to confirm this conclusion because even those churches in Umbria with retrochoirs that he examined had tramezzi. It has been noted that the tramezzi were removed in the late sixteenth and seventeenth centuries. I connected Duke Cosimo de’ Medici’s order to remove the tramezzi in Santa Maria Novella and Santa Croce with his desire to conform to the spirit of the Council of Trent (1545–63). No one has questioned this conclusion, and scholars now routinely give the Counter-Reformation as the reason for the almost universal removals. One should note, however, that not a single word in the decrees or the discussions of Trent refers to rood screens, nor are they mentioned in Carlo Borromeo’s Instructiones fabricae et supellectilis ecclesiasticae (1577), which lay out detailed rules for the renovation of church buildings in the wake of Trent.43 One would expect to find mention there, since every detail of the church building is spelled out, and, furthermore, he was especially keen on separating the sexes. Borromeo’s silence on rood screens may reflect the fact that he was addressing himself not to monastic churches but to secular churches. Trent’s concern to care for the laity and to eradicate any basis for the Protestant accusation that the Roman Catholic Church was elitist and only concerned with the clergy was evident in the early sessions of the council and consistently reiterated throughout the deliberations. There is direct evidence that visibility and access were motives guiding one post-Trent renovation. Contemporary documents refer to the new choir to be constructed in Carlo Borromeo’s own cathedral in Milan. In 1572 Martino Bassi claimed for his plan (which was not accepted) that it would give great ornament and majesty to the church and the city because one would see and hear the divine offices equally well from all parts of the church.44 One of the purposes of the raised stage of the tramezzo was, after all, to proclaim the Gospel, because it was the only place in the church from which both the clergy and the laity could be addressed at the same time. The presence of a lectern or ambo on top of many tramezzi, even the single-wall type, attests to this function. Such a location for the ambo can be seen in the fresco by the Assisi Master, Saint Francis at Greccio, where we are viewing the screen from inside the choir.45 There is an ambo atop the tramezzo in the church at Vezzolano, as well (fig. 10). Nave interior of Santa Maria sopra Minerva, Rome. When the decision was made to transfer the choir, the original plan was to enlarge the cappella maggiore. Two houses were bought up to provide the necessary space, but in the end the extension was not built and the friars’ stalls were fitted into the existing space.48 Interestingly, the cardinal executors of the testament of Clement VII, who had died in 1534, were in touch with Duke Cosimo in Florence, who was kept well informed of the progress of this Medici project. This model would have been in Cosimo’s mind when, seventeen years later, he ordered the renovation of the Dominican church in Florence and then the Franciscan church as well. 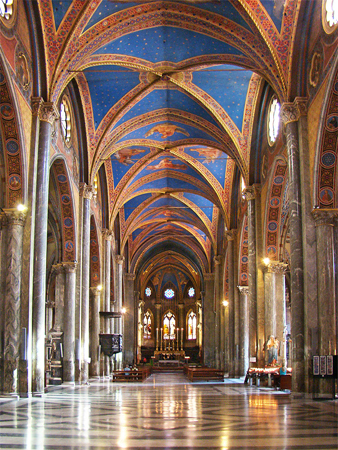 It is important to recall that Rome provided a model for a retrochoir in the Augustinian church of Santa Maria del Popolo, which had been in place since the construction of the church in the 1470s.49 The design, which allowed for an open and unified view of the whole church, might well have been in the minds of those who worked on remodeling Santa Maria sopra Minerva and Santa Maria in Aracoeli. Nave interior of Santa Maria in Aracoeli, Capitoline Hill, Rome. Photo: Dnalor. Thus both the Dominican and Franciscan churches in Rome had been renovated shortly before Cosimo initiated his program in Florence along the same lines. Although there is no specific mention in the records (which date from the seventeenth and eighteenth centuries) of a rood screen either in the Minerva or the Aracoeli, it seems likely that some protection must have been provided for the friars. Tramezzo at Benedictine church of Vezzolano. Photo: Alinari. Another group of tramezzi has survived in the fifteenth-century Observant Franciscan churches in northern Italy—in Lombardy, Piedmont, and the Tessine (Switzerland)—because they were covered with frescoes. These churches were single nave in plan, but departed from the norm in having a dividing wall that reached all the way to the ceiling, forming a diaphragm arch. Their tramezzi were deep, supported on an arcade with recessed chapels flanking the central door. This wall provided a large surface on which was frescoed typically the Passion of Christ, centering on the Crucifixion—for example, at Santa Maria delle Grazie at Varallo with frescoes by Gaudenzio Ferrari (fig. 11).56 In several instances the space was partially opened up after the Council of Trent and visibility gained by removing the rear wall and transferring the chapels under the tramezzo to other locations. Santa Maria delle Grazie, Varallo. The question of initiative has recently resurfaced. It is clear in the case of the Florentine Dominican and Franciscan churches that it was Duke Cosimo, and not the orders, who ordered the renovations. For Venice, however, Modesti has found that there was an Apostolic Visitation in 1581 examining all the churches to determine whether the choirs interfered with the liturgy. There was a clear mandate on papal authority to enforce uniformity and assure visibility in all churches. 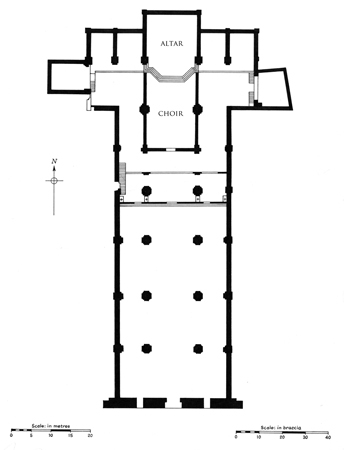 Plan of retrochoir at Santissima Annunziata, Florence, 1449. Although the retrochoir had been used only intermittently prior to the Council of Trent, it was the preferred solution after the council.60 Most of the tramezzi in existing churches were torn down and the choirs transferred behind the high altar after Trent. The cliché to explain these renovations, used not only by Vasari but universally, that the tramezzo impeded the view of the church, covers both the liturgical reason for their removal and provides an aesthetic excuse.61 There is substantial evidence that an aesthetic preference had already developed by the 1470s for unified churches without interrupting rood screens.62 I have noted the compromise plan in the Frari in Venice (1475), and the retrochoir designed for Santa Maria del Popolo in Rome (also 1470s). One can add the renovation of Santissima Annunziata in Florence, begun in 1449, where a tribuna with retrochoir replaced the old tramezzo (fig. 12). The motive was certainly aesthetic, reflecting Quattrocento enthusiasm for central plan design all’antica, whether or not it suited liturgical needs. The tramezzo and existing choir in the nave were torn down. Behind the high altar was designed a rotunda with radiating chapels, at the center of which the choir was placed. Although this was an elegant Renaissance central plan, it did not function very well, and access to the choir was a problem. James Ackerman pointed to the friction between the theory (a beautiful round form) and practice (the privacy of the friars and their view of the high altar).63 However, it reflected the Renaissance and Baroque preference for a unified space. In the Florentine Cistercian church of Cestello in 1498, the choir was transferred from its usual site in the nave to a location behind the altar.64 But as Ackerman pointed out, in the later Quattrocento, retrochoirs were being built simultaneously with new tramezzi. He cites in Venice San Michele in Isola, where a tramezzo was built in 1469 or a little later, in which the congregation was squeezed into one and a half of the five bays.65 At Cestello a tramezzo was belatedly added in 1524, even with the choir behind the altar, and in Badia a Passignano the tramezzo was constructed and paintings commissioned for it in 1549. In new church construction after Trent, Palladio’s example in his San Giorgio Maggiore, designed in 1565, and Il Redentore, designed in 1577 (figs. 13-14), provided a model that would be followed in many Baroque churches. Plans of San Giorgio Maggiore and Il Redentore in Venice, by Andrea Palladio, with Choir and screen behind the altar. Drawing: Bertotti-Scamozzi. We should ask what the function of the tramezzo was when the choir was behind the high altar. Certainly it could shield the religious as they processed between their cloister and choir; Cooper’s discussion of double-faced altarpieces indicates that they were not successful in screening the retrochoir. Recent research makes it clear that segregation of the sexes was an important part of the tramezzo’s raison d’être.66 More research needs to be done on the process by which the sexes were eventually allowed to worship side by side if we are to understand what happened after the tramezzi were demolished, and how this issue may have affected the decisions whether or not to raze them. It is also clear that we need to see more research examining specific religious orders and geographical areas. We need to know more about the typical arrangement in cathedrals and other churches officiated by canons (who were not cloistered), so that we can separate issues of privacy from segregation of the sexes. And a major question remains unanswered: like other research in this field to date, this study has been able to shed very little light on the question of the origin of the Western rood screen or its relation to its Byzantine counterpart. The above article is an updated version of “The Tramezzo in the Italian Renaissance, Revisited,” Sharon E.J. Gerstel, ed. Thresholds of the Sacred (Washington, D.C., 2006), 215-232. I wish to thank Joanne Allen for the updates to literature since 2006. 1. The publications referred to are M. Hall, “The Ponte in S. Maria Novella: The Problem of the Rood Screen in Italy,” JWarb 37(1974): 157-73; eadem, “The Tramezzo in Santa Croce, Florence, Reconstructed,” Art B, 56 (1974): 325-41. See also eadem, “The Tramezzo in Santa Croce, Florence, and Domenico Veneziano’s Fresco,” Burlington Magazine 112 (1970): 797-99; eadem, “The Italian Rood Screen: Some Implications for Liturgy and Function,” in Festschrift for Myron Gilmore, (Florence, 1978); and eadem, Renovation and Counter-Reformation: Vasari and Duke Cosimo in Santa Maria Novella and Santa Croce, 1565-77, Oxford-Warburg Series (Oxford 1979). 2. E. Doberer, the authority on German screens in particular, has created a catalogue of types that can be generally applied; see Doberer, “Der Lettner,” in Mitteilungen der Gesellschaft für vergleichende Kunstforschung in Wien 9 (1956); 117ff. 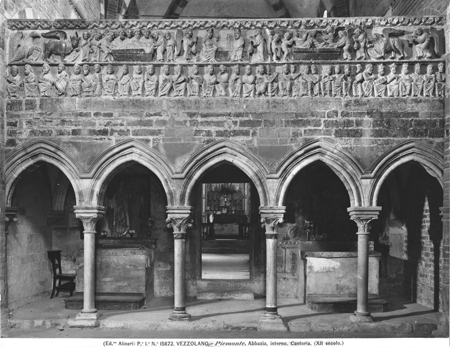 On the English screens, particularly useful is A. Vallance, Greater English Church Screens, Being Great Roods, Screenwork and Rood-Lofts in Cathedral, Monastic and Collegiate Churches (London, 1947). See now Jacqueline Jung’s definitive contribution: The Gothic Screen. Space, Sculpture, and Community in the Cathedrals of France and Germany, ca. 1200–1400 (New York: Cambridge University Press, 2012). 3. Donal Cooper, “Franciscan Choir Enclosures and the Function of the Double-Sided Altarpieces in Pre-Tridentine Umbria,” JWarb 64 (2001): 46, 47. 4. Giorgio Vasari, the 16th- c. art historian and author of Le vite de’ più eccelenti pittori, scultori ed architettori (Florence, 1568), used the term tramezzo more than 50 times to describe structures in churches; he also used barco several times referring to similar structures in the Veneto. 5. The foundations of the tramezzo in Santa Croce were discovered during work on the floor following the flood in 1966 and were identified as such by me in 1972. 6. 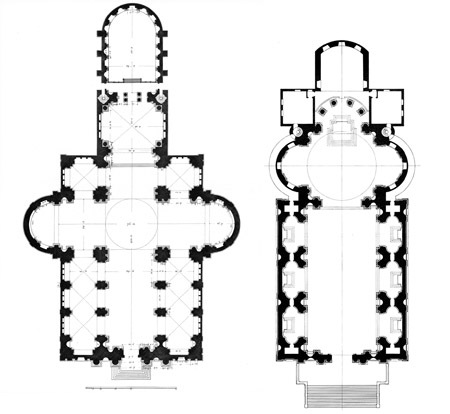 This plan is very similar to the configuration of the screen in the single nave, albeit smaller, Byzantine churches of the late 13th to 15th c., as Sharon Gerstel has kindly pointed out. 7. See now Donal Cooper and Janet Robson’s full treatment of Assisi: D. Cooper and J. Robson, The Making of Assisi. The Pope, the Franciscans and the Painting of the Basilica (London: Yale University Press, 2013). 8. Numerous such roods have survived, e.g., Giunta Pisano (Bologna), Coppo di Marcovaldo (San Gimignano), Cimabue (Arezzo; Florence, Museo di S. Croce), Giotto (Florence, Ognissanti). The English word indicates the size: a rod was 16.5 feet. These Italian roods typically are about 4.5 m tall. 9. J. E. Jung, “Seeing through Screens: The Gothic Choir Enclosure as Frame,” Thresholds of the Sacred: Architectural, Art Historical, Liturgical and Theological Perspectives on Religious Screens, East and West, ed. Sharon Gerstel (Washington, DC: Dumbarton Oaks, 2006), fig. 1. 10. G. Meersseman, “L’architecture dominicaine au XIIIe siècle: Législation et pratique,” AFP 16 (1946): 162-63, citing Monumenta Ordinis praedicatorum historica, 3:47. Our understanding of the medieval Italian monastic church interior, particularly the Dominican churches, has now been illuminated by Joanna Cannon’s seminal contribution: Religious Poverty, Visual Riches. Art in the Dominican Churches of Central Italy in the Thirteenth and Fourteenth Centuries (London: Yale University Press, 2013). 11. Meersseman, “L’architecture dominicaine au XIIIe siècle,” 186. 12. Jung, “Seeing through Screens” (above, n. 9), fig 2. 13. W. R. Bonniwell, A History of the Dominican Liturgy, (New York, 1944), 162-64. 14. Hall, ”Italian Rood Screen,” (above, n. 1), 215. 15. The question of women’s movements in monastic churches is discussed by A. Randolph,“Regarding Women in Sacred Spaces,” in Picturing Women in Renaissance and Baroque Italy, ed. G. A. Johnson and S. F. Matthews Grieco, (Cambridge, 1997), 17-41. 16. D. Cooper, “Access all Areas? Spatial Divides in the Mendicant Churches of Late Medieval Tuscany,” in Ritual and Space in the Middle Ages: Proceedings of the 2009 Harlaxton Symposium, F. Andrews, ed. Harlaxton Medieval Studies, XXI (Shaun Tyas, 2011), 102–4. 17. P.A. Riedl and M. Seidel, Die Kirchen von Siena (Munich, 1985), 1:162, cited by I. Hueck. 18. 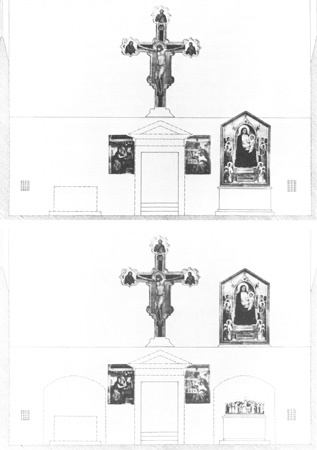 Cooper,”Franciscan Choir Enclosures” (above, n. 3), 6. 19. I am grateful to Robert Gaston (”Sacred Place and Liturgical Space: Florence’s Renaissance Churches,” in Renaissance Florence: A Social History, ed. R. J. Crum and J. T. Paoletti [New York, 2006]) for sharing his transcription of the Latin text of Lapaccini on which the reconstruction described here is based. 20. I. Hueck, “Le opere di Giotto per la chiesa di Ognissanti,” in La Madonna d’Ognissanti di Giotto restaurata, Gli Uffizi Studi e Ricerche 8 (Florence, 1992), 37-50. 21. Fra Antonio Pierozzi (1389-1459), a Dominican, was appointed archbishop of Florence in 1446 and canonized in 1523. 22. Cited by Gaston, ”Sacred Place” (above, n. 19). 23. Vallance, Greater English Church Screens, (above, n. 2), 27. 24. Cooper, “Franciscan Choir Enclosures,” fig. 2. 26. A. Rubbiano (La chiesa di S. Francesco [Bologna, 1886], 3), cites libri di spese and Chronicles, where the north aisle between the curtains of the choir and the perimeter wall was said to be reserved for the women. 27. See S. Gerstel, “Painted Sources for Female Piety in Medieval Byzantium,” DOP 52 (1998): 89-111. 28. N. Newbigin, Feste D’Oltrarno: Plays in Churches in Fifteenth Century Florence, 2 vols. (Florence, 1996). For models and reconstructed ground plans, see also Il Luogo teatrale a Firenze, exh. cat. (Florence, 1975). 29. Cannon, Religious Poverty, Visual Riches (above, n. 10), 25, 36; Jung, The Gothic Screen (above, n. 2), 22–23. 30. M. Luther, “A Prelude on the Babylonian Captivity of the Church,” in Three Treatises (Philadelphia, 1943), 150. 31. Cannon, Religious Poverty, Visual Riches (above, n. 10), 38. 32. Santa Maria del Carmine in Pisa was an interesting hybrid. 33. The deep tramezzo in SS. Annunziata, Florence, which was demolished in the mid-Quattrocento, is discussed below. 34. Rubbiano, when he regothicized San Francesco in Bologna in the 1880s, discovered evidence for a deep tramezzo separated from the choir enclosure (La chiesa di S. Francesco, 1886, and later revised editions). See Hall, “The Ponte in S. Maria Novella,” 166 and pl. 34b. 35. On Venice, see now Modesti, “I cori nelle chiese veneziane,” which greatly increases our knowledge of the situation in monastic and parochial churches. The carved marble choir enclosure in San Giovanni in Bragora has been reconstructed. 36. For example, San Niccolo in Oltrarno in Florence—see G. Damiani and A. Laghi, eds., San Niccolò Oltrarno: la chiesa, una famiglia di antiquari (Comune di Firenze, 1982), esp. 28–30; and for churches in northern Italy: Tiziana Franco, “Sul ‘muricciolo’ nella chiesa di Sant’Andrea di Sommacampagna ‘per il quale restavan divisi gli uomini dalle donne,’” Hortus artium medievalium 14 (2008), 181–92. 37. Cistercian: Cestello (A. Luchs, Cestello: A Cistercian Church of the Florentine Renaissance [New York, 1977]); Badia di Settimo (Vasari, “Life of Ghirlandaio,” 3:491). The references to Vasari, Le vite de’ più eccelenti pittori, scultori ed architettori: nelle redazioni del 1550 e 1568, are to the edition by R. Bettarini and P. Barocchi, 6 vols. (Florence, 1966-87). 38. Vallombrosan: San Michele a Badia a Passignano. 39. Camaldolese: Camaldoli (Vasari, “Life of Vasari,” 6:375); Bologna, Badia di Camaldoli (Vasari, “Life of Cristofano Gherardi,” 5:288). 40. The original church of the Benedictines at Montecassino had a tramezzo; a very interesting structure survives in its dependency at Santa Maria in Val Porclenata (Abruzzi). 41. Servites: Santissima Annunziata discussed below. Augustinians: S. Agostino, Siena, discussed above; S. Agostino, Loreto (Vasari, “Life of Andrea Sansovino,” 4:281). Carmelites: S. Maria del Carmine, Pisa (Vasari, “Life of Masaccio,” 3:127); S. Maria del Carmine, Florence, discussed below. 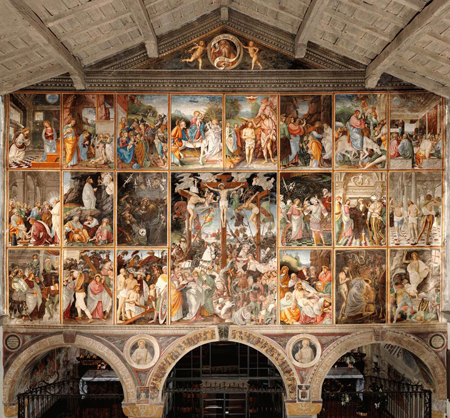 Other Dominican churches with tramezzi mentioned by Vasari include: S. Domenico, Mantua (Vasari, “Life of Scarpaccia,” 3:619); S. Domenico, Modena (Vasari, “Life of Garofano,” 5:420); S. Caterina, Pisa (Vasari, “Life of Margaritone,” 2:92). Other Franciscan churches known to have had tramezzi include: S. Francesco, Fiesole (Vasari, “Life of Piero di Cosimo,” 4:68); S. Bernardino, Verona (Vasari, “Life of Fra Iacondo,” 4:566, 585). 42. The enclosure of the canons’ choir in Italian cathedrals seems to have been with low walls (see Hall, “The Ponte in S. Maria Novella” [above, n. 1], 167). 43. Milan, 1577. In P. Barocchi, ed., Trattati d’arte del Cinquecento fra manierismo e controriforma (Bari, 1960-62), 3:1-113. There is a translation by E. C. Voelker, “Charles Borromeo’s Instructiones fabricae et supellectilis ecclesiasticae, 1577; A Translation with Commentary and Analysis,” (Ph.D. diss., Syracuse University, 1977). 44. “Che sarebbe a maggior decoro e maestà del Tempio e della città: poiché si vedrebbero e si udirebbero i divini ufficij egualmente da tutte le parti di esso Tempio con commodo e contento grande de’ rigurardanti.” Quoted by C. A. Isermeyer, “Le chiese del Palladio in rapporto al culto,” Bollettino del Centro Internazionale di Studi di Architettura, Andrea Palladio 10 (1968): 52; M. Bassi, Dispareri in materia d’architettura et perspettiva: Con pareri d’eccellenti, et famosi architetti, che li risoluono (Milan, 1572), 42. Isermeyer recounts the history of the Cassinese Order, which considered converting to a retrochoir in S. Giustina in the 1470s, a plan that was executed in the mother church of Montecassino in 1543-45. 46. G. Palmerio and G. Villetti, Storia edilizia di S Maria sopra Minerva in Roma, 1275-1870, Università degli studi di Roma “La Sapienza,” Dipartimento di storia dell’architettura, restauro e conservazione dei beni architettonici, Studi e documenti I (Rome, 1989), 143-44. 47. Brandi, Cronica, p. 15r: ”Era anticamente il Coro in mezzo della Chiesa cinto di fuori da alcuni altari ne quali si celebrava.” Quoted by Ursula Kleefisch-Jobst, Die römische Dominikanerkirche Santa Maria sopra Minerva: Ein Beitrag zur Architektur der Bettelorden in Mittelitalien (Münster, 1991), 126 n. 59. 48. On the Medici tombs, see P. Pecchiai, “I lavori fatti nella chiesa di Santa Maria sopra Minerva per collocarvi le sepolturie di Leone X e Clemente VII,” Archivi d’Italia e rassegna internazionale degli archivi, ser. 2, 17 (1950): 199-208. 49. See S. de Blaauw,”Das Hochaltarretabel in Rom bis zum frühen 16.Jahrhundert: Das Altarbild als Kategorie der liturgischen Anlage,” Mededelingen van het Nederlands Instituut te Rome 55 (1996):100-102, who noted also the retrochoir in Sant’Agostino in Rome; cited by Cooper, “Franciscan Choir Enclosures” (above, n. 3), n. 12. 50. Riforma pretridentina della Diocesi di Verona: Visite Pastorali del Vescovo G. M. Giberti, 1525-42, ed. A. Fasani (Vicenza, 1989). See A. Nagel. Michelangelo and the Reform of Art (New York, 2000), 86. 51. P.F. Casimiro Romano, Memoria istoriche della chiesa e convento di S. Maria in Araceli di Roma (1735) (Rome, 1845), 51-58. S. F. Pagden summarized the literature on the replacement of Raphael’s painting with the icon: “From Cult Image to the Cult of Images: The Case of Raphael’s Altarpieces,” in The Altarpiece in the Renaissance, eds. P. Humfrey and M. Kemp (Cambridge, 1990), 165-89, esp. 175-76. 52. On Pope Sixtus V’s renovation of Santa Sabina, see A. Munoz, Il restauro della basilica di Santa Sabina (Rome, 1938). On the tramezzo, see now J. Barclay Lloyd, “Medieval Dominican Architecture at Santa Sabina in Rome, c. 1219–c. 1320,” Papers of the British School at Rome 72 (2004), 231–92; Cannon, Religious Poverty, Visual Riches (above, n. 10), 36. 53. A. Rava, “Le jubé de Vezzolano et les reliefs antélamiques du portail de Sant-André à Vercelli,” in La couleur et la pierre: Polychromie des portails gothiques. Actes du colloque, ed. D. Verret and D. Steyaert (Paris, 2000), 163-74, esp. 163-68. 54. For the surviving relief of Saint Martin sharing his Cloak with the Beggar in the Museo Santa Croce, see Hall, “The Tramezzo in Santa Croce” (above n. 1), 326, fig. 2. 55. On Domenico Veneziano’s fresco of Saint Francis and Saint John the Baptist, also now in the Museo Santa Croce, which Vasari recorded having moved, see Hall, “The Tramezzo in Santa Croce, Florence, and Domenico Veneziano’s Fresco” (above, n. 1). 56. K. I. Oehry, Die Kirchen der Franziskanerobservaten in der Lombardie (Essen, 1991); A. Nova, “I tramezzi in Lombardia fra XV e XVI secolo: Scene della Passione e devozione francescana,“ in Il francescanesimo in Lombardia (Milan, 1983), 196-215. Patetta, “La tipologia della chiesa ‘doppia’”, 20, lists sixteen churches belonging to this group. 57. See M. M. Ghedini, “Il tramezzo nella chiesa dei santi Giovanni e Paolo a Venezia,” in “De lapidibus sententiae” : Scritti di storia dell’arte per Giovanni Lorenzoni, eds. T. Franco and G. Valenzano (Padua, 2002), 257–62. 58. Modesti, “I cori nelle chiese veneziane”, 43. An interesting discussion reveals the decision-making process in the Vallombrosan church at Badia di Passignano. 59. “Far l’entrata dietro alle Capelle, che si possa di dormitorio venire in coro, servirà, che i Frati non siano visti.” Document 2, Hall, Renovation and Counter-Reformation (above, n. 1), 168. 60. An early and monumental example was in Santa Chiara, Naples, where it was invented to solve the problem of screening the nuns and at the same time giving them a view of the altar. At the front of their choir, grated windows opened onto the high altar, through which the nuns could see but not be seen. C. Bruzelius, “Hearing is Believing: Clarissan Architecture, ca. 1213-1340,” in Gesta 31.2 (1992): 83-91. 61. Bocchi, as an example, refers to Ognissanti after its tramezzo was demolished as “più luminosa, più adagiata, più spedita.” Le Bellezze della città di Fiorenza (Florence, 1591), 101, quoted by Gaston, “Sacred Place” (above, n. 19), n. 113. 62. James Ackerman uncovered a tendency, beginning with SS. Annunziata, Florence, in 1449, and gathering some momentum in both Florence and Venice in the late Quattrocento, to put the choir behind the high altar; “L’architettura religiosa veneta in rapporto a quella Toscana del Rinascimento,” Bollettino di Centro Internazionale di studi di architettura Andrea Palladio 19 (1977): 135-64. 63. Ibid., 148. See also B. L. Brown, “The Patronage and Building History of the Tribuna of SS. Annunziata in Florence: A Reappraisal in Light of New Documentation,” Mitteilungen des Kunsthistorisches Institut Florenz 25 (1981): 59-146. Retrochoirs called for double-faced altarpieces. As had previously been done in Santa Maria Novella in the 1490s, when choir stalls were built there behind the high altar, a large double-faced altarpiece was installed in 1507 in SS. Annunziata for the dual purpose of giving the friars a focus for their attention and to screen them from the eyes of the congregation. The commission was awarded to Filippino Lippi, who died in 1504 before completing it, and Perugino was called upon to finish it. J. Nelson, “The High Altar-Piece of SS. Annunziata in Florence: History, Form, and Function,” Burlington Magazine 139 (1997): 84-94. 64. The new arrangement gave the monks access independent of the nave. Privacy and isolation were certainly the issue, as a document attests. 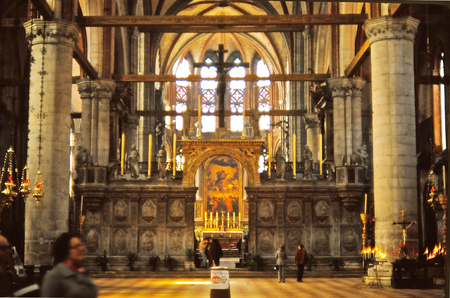 Even after the construction of the new choir, an order by the Cistercian visitor in 1505 required that curtains immediately be provided to the right and left of the high altar, ”so that the monks in the choir may not be seen by laymen and disturbed.” Luchs, Cestello (above, n. 37), 29. 65. Ackerman, “L’architettura” (above, n. 54), 151. I discussed and illustrated the Renaissance style tramezzo in San Michele a Isola in, “The Ponte in S. Maria Novella” (above, n. 1), pl. 38a-b. 66. Cooper (“Franciscan Choir Enclosures” [above, n. 3], 53) reached this conclusion.